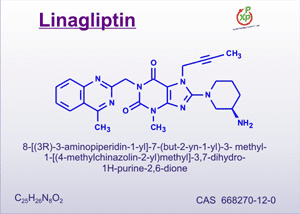 Linagliptin (Tradjenta) Possible Approval for Use in Europe for Type 2 Treatment: Linagliptin (sold under the name Tradjenta) has been available in the United States for those with type 2 diabetes since May 2011, when the Food and Drug Administration gave their approval for its use at that time. Tradjenta is an oral medication and comes in 5 mg tablets. Tradjenta has proven to be effective for those with type 2 diabetes who had difficulties tolerating metformin or those with kidney problems. Tradjenta is used along with diet and exercise to lower blood sugar levels. Tradjenta is not approved for use in conjunction with insulin or for the use in children. Tradjenta can cause low blood sugar levels, resulting in insulin reactions. In June 2011, Boehringer Ingelheim and Eli Lilly and Company, the makers of linagliptin, received a positive response from the European Medicines Agency’s (EMA) Medicinal Committee recommending that linagliptin in the 5 mg dose, film-coated tablets, be approved for use in Europe. “The Committee for Medicinal Products for Human Use (CHMP) has recommended the approval of linagliptin as a monotherapy in patients inadequately controlled by diet and exercise alone and for whom metformin is inappropriate due to intolerance, or contraindicated due to renal impairment.” They are also recommending that linagliptin might be used in combination with metformin and metformin plus sulfonylurea. Their research showed that when linagliptin was used in conjunction with metformin, it reduced the A1C levels by 0.6 to 0.7 percent when compared to the use of a placebo. The positive opinion for the use in Europe of linagliptin was based on a clinical trial program that involved approximately 4,000 adults with type 2 diabetes. Type 2 diabetes has increasingly been diagnosed around the world. Linagliptin will be a new treatment available in the UK for those suffering from type 2 diabetes and are having difficulties controlling their blood sugar levels. This entry was posted in Diabetes News on July 14, 2011 by admin.